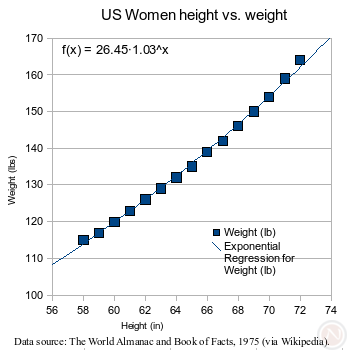 For while, charts in Calc could do regression analysis, and starting in OpenOffice.org 2.4, there is an easy way to display the equation to the chart. In case statistics class is a fuzzy memory for you, a regression curve calculates a mathematical function to describe a set of data. Regression is helpful with predictions. For example, looking at the chart on the right. 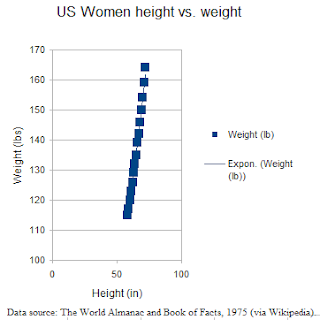 There are no values for a woman 80 inches tall, but using either the curve or its function, her height could be extrapolated to about 198 lbs. Create an XY (Scatter) Chart. Click off the chart to make sure the chart is not selected. Double click the chart to enter chart edit mode. Choose the type of regression line you want. Carefully right click the regression line. Choose Insert Regression Curve Equation. Enter chart mode if you are not already in it. Since before OpenOffice.org 2.4, the regression curve equation and coefficient of determination R2 are visible by clicking on the curve. Please keep in mind I am using an early OpenOffice.org 2.4.0 development snapshot 680m239. Before the final release in March 2008, the code will be more polished. There are a few differences between Excel 2003 and OpenOffice.org. The proportions of the chart change importing into Excel. The image above is from the Excel 2003 application imported from OpenOffice.org. 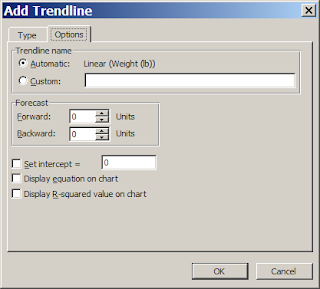 Excel uses the term trendline instead of regression curve equation. Both applications allow the use of the context menu (right click) to add, clear, and configure trendlines, but OpenOffice.org also has the Insert->Statistics menu option. OpenOffice.org's context menu for adding the function is limited. It simply adds a linear regression curve. 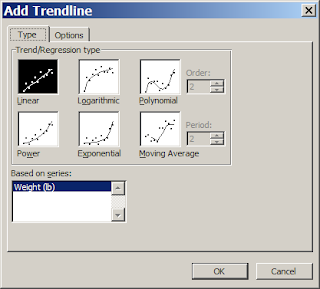 Excel 2003 allows changing the trendline between types (e.g., from linear to exponential) by clicking on the trendline, but in OpenOffice.org, you must choose the data series instead (issue 44768). Excel 2003 shows more precision by default than OpenOffice.org, but you can add precision by right clicking on the equation. Then, choose Object Properties. Then, go the Numbers tab. Then, change Category to Number. Then, set Decimal places. 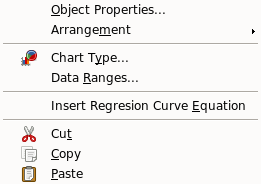 Excel 2003 has a few more configuration options such as moving average (issue 66819), polynomial regression (issue 20819), forecast units (issue 5085), and intercept (issue 77932). The following two images are Excel 2003. This feature was originally requested in 2002 as issue 7998. With 72 votes, it is the second-highest rated enhancement or feature request scheduled for OpenOffice.org version 2.4. Issue 7998 is also fairly high on the list of all unresolved issues by number of votes. OpenDocument 1.1 is currently the latest approved version, but the feature specification reveals the use of ODF 1.2. ODF 1.2 is scheduled for OpenOffice.org 3.0. I downloadrd Staroffice 8 Product Update 9 which does not have the insert equation capability as described by you on OpenOffice 2.4. I thought both versions are same, and when I check for updates, I get the message that StarOffice is up to date. Is there any idea when this update would be available? Thanks. StarOffice 8 Product Update 9 seems to be OpenOffice.org 2.3, so it would not support this feature. OpenOffice.org 2.4 is not yet released, and it may be out next week. I am not sure what the lag is for SO after OOo is released. Thanks for the tip about changing the number format to get the desired number of decimal places! OpenOffice.org Ninja brings you news, previews, reviews, tutorials, tips, and howtos. Copyright 2009 by . All rights reserved. See license.